Mongolian Folktales contains 25 short folktales. As we learn in the introduction by Dr. Pureviin Khorloo, these stories originated as orally transmitted tales. Khorloo explains that Mongolian folktales are categorised into five types: animal stories, those that discuss magical events, those that discuss domestic matters, satirical tales, and stories about the relationship between humans and nature. In some parts of Mongolia, these stories would have been narrated to lute music, but in other areas the storyteller would perform unaccompanied. Unfortunately, according to Khorloo, there are no longer any professional storytellers left in Mongolia. By the mid 20th century scholars had realised that storytelling was dying out, and so Khorloo and other proponents of Mongolian cultural heritage travelled around recording stories onto cassettes and transcribing them. It is thanks to their efforts that we can now read and share these tales that have been preserved from a lost era. I am going to discuss two of the stories from Mongolian Folktales. The first story in the collection is called How storytelling began among the Mongolian people. It tells the tale of a young boy called Tarvaa. Tarvaa’s spirit thought that his body had died of the plague, and so travelled to the underworld. However, the Great Khan of the underworld knew that Tarvaa was still alive, and so sent his spirit back. Before he left, however, he was allowed to pick out whatever item he wanted from the cornucopia of things kept in the underworld. Tarvaa’s spirit chose to take tales and legends, then travelled back and entered his body. When Tarvaa awoke, he found that crows had picked at the tissue in his eye sockets and blinded him. However, his new knowledge of stories enabled him to become a beloved storyteller. This folktale reveals some important things about the traditional Mongolian way of seeing the world. It carries a dualist philosophy of strong separation between the spirit/mind and the body. The two are so unconnected in this tale that Tarvaa’s spirit makes the wrongful judgment that his body is going to die, when in fact it will recover. The spirit is given primary importance in the story, as it is the part of Tarvaa that is able to communicate and make decisions. The spirit does not need to speak “through” the lips and mouth of the body, but can express itself as a completely separate entity. Interestingly, the spirit seems to possess some sort of physicality, as the story tells us that it was “trembling with fright” before the Great Khan. The spirit also does not seem to have any obvious supernatural powers, and this makes it more relatable as a character. Although Tarvaa’s body becomes irreparably injured, he is still able to live a good life because his spirit is content. This reinforces the idea that the spirit triumphs over the body. The fact that the spirit is so strongly connected with stories in this tale demonstrates that Mongolians conceive of the experience of listening to or reading a story as something connected to the deeper realms of human existence. Khorloo makes another important point about this creation story in the introduction. He says: “Blind Tarvaa tells about a man who is poor...The story of Tarvaa means, in a sense, the profound and simple fact that stories are generated and passed along by normal people.” I would like to add to this that Tarvaa, by being a representation of a common boy, encourages young children in Mongolia who hear the story. It carries the message that humble upbringings can lead to greatness later in life, and that physical disability does not necessitate the impossibility of a fulfilled life. It also promotes acceptance of sick people in society, as Tarvaa is afflicted with the black plague, yet is cast as the hero. The second folktale that I am going to explore is called The legend of Erkhii Mergen, the archer. This story shares the same basic root as the Chinese myth of the archer Hou Yi. In Chinese lore, when 10 suns rose from earth and scorched the fields, turning the world into a wasteland, Hou Yi shot down 9 of them, leaving only one, and thus saved people from starvation. It is interesting to compare the Mongolian and Chinese versions of the archer story, and to hypothesise about why they are different. The most apparent initial difference is that in the Mongolian version of the story there are only 7 suns to be shot down, rather than 10. Perhaps, in the Chinese tale, there are 10 suns so that Hou Yi can shoot down 9, which is an auspicious and imperial number. In Mongolia, numerology is not as important as it is in China, and the number 9 does not carry the same significance. It is likely that the number changed from 9 to 7 merely because Mongolian storytellers did not place as much value on making sure that they remembered the number of suns correctly. I will now discuss some of the larger plot differences between the two stories. In the Chinese tale, Hou Yi is given a pill of immortality as a reward for his achievements. I think that this reflects the historic importance of Daoism in China, which emphasises the search for immortality. There is no such pill in the Mongolian version. In fact, Erkhii Mergen does not succeed in his quest. Unlike Hou Yi, who planned to leave 1 sun remaining, Erkhii desired to shoot down all of the suns. At the moment when he aims his bow at the last sun and fires his arrow, a swallow flies in front of it. His arrow pierces the swallow’s tail, thus creating the unique split tail of the bird. This plot twist displays the Mongolian people’s intense interest in nature. The story seeks to explain and give meaning to the shape of a particular bird, showing a curiosity about ornithology. After his failed shot, Erkhii cuts off his thumbs and transforms himself into a marmot as self-punishment. Just as Erkhii fails at his archery task, his horse fails to help Erkhii catch the swallow and get revenge. Thus, man and horse are spiritually linked and share the same fate. The horse asks his master to cut off his forelegs, and this mirrors Erkhii’s amputated thumbs. Like Erkhii, the horse transforms into a rodent (a jerboa) after his punishment, and this further cements the bond between the human and the animal. These cases of self-punishment point to something else that is present in the Mongolian version of the story but not in the Chinese one. Both Ekhii and his horse punished themselves because they had broken promises. This demonstrates the strong value of loyalty in Mongolian culture, which can also be seen in other texts such as The Secret History of the Mongols, the oldest surviving work of Mongolian literature, written for royal descendants of Temüjin. (Genghis Khan). 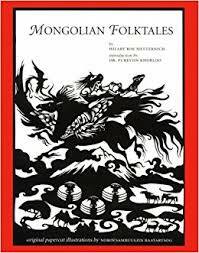 Details: Mongolian Folktales edited by Hilary Roe Metternich, illustrated by Norovsambuugiin Baatartsog is published in paperback by Avery Press.